Kay Jones has been in the travel industry for 30 years, 28 of them with Sanborn’s Travel. She holds the coveted CTC (Certified Travel Counselor) as well as the DS (Destination Specialist) designation in multiple areas of the world. 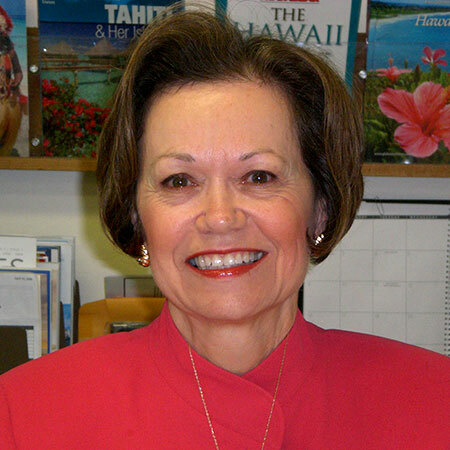 Not only has she completed extensive training to be a Virtuoso Agent, but Kay has become a Virtuoso Specialist for Hawaii having been to the destination over 30 times. Cruising and International travel are two specialties that she sometimes combines making her our Mediterranean cruise specialist. Whether you want a Transatlantic Crossing or a Caribbean cruise, Kay Lynn’s knowledge of ships, cabin types, and ports of call is unmatched.